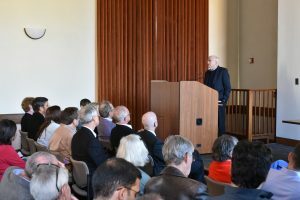 Professor Martin Feldstein gave the MAE Distinguished speaker talk on “The Future of Taxes, Money, and the Stock Market”. Professor Feldstein is the George F. Baker Professor of Economics at Harvard University and President Emeritus of the National Bureau of Economic Research. From 1982-1984, he was Chairman of the Council of Economic Advisors and President Ronald Reagan’s chief economic advisor. He was a member of the President’s Foreign Intelligence Advisory Board under President George W. Bush and of the President’s Economic Recovery Advisory Board under President Barack Obama.